Last week Tom and I bought a Chevy Volt. This is the car that runs on electricity for 37 miles and then on a 10 gallon tank of gas. It’s a hybrid but one that has ZERO carbon emissions if only run on electricity. That’s Tom’s goal, to see if we can run it electrically, i.e. around town. It’s easy. You plug it into a regular 110-volt outlet. The charger looks like a hairdryer. Unlike my computer, it actually holds the charge. I see more and more charging stations popping up in public places so you can charge when you out if you need to. A lovely thing happened as we were finalizing the deal. We were signing papers at a showroom table. In walked a tall, lanky, blonde-haired t.v. news reporter, Laura Evans, and her camera man. They were there to do a story on the alternative fuel cars and, there we were, the only customers that early Monday morning. 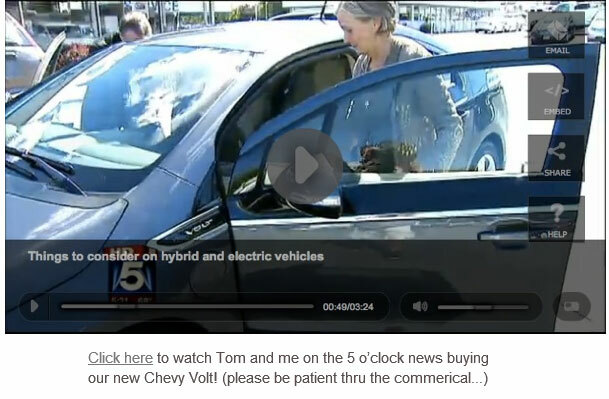 Don’t be mislead by Laura’s comment in the piece that the Volt isn’t good for you if you commute 60 miles per day. NOT SO! You can commute 437 miles – without stopping! When the electricity is gone, you’ve still got another 400 miles on gasoline. Tom and I bought it primarily as a statement to the auto manufacturers that we support them in finding alternatives to oil. “You build a good-looking, non-oil car and we will put our money on it.” (My dad’s thrilled because my mother’s first car was a 1946 Chevy). We took action – decided to be pioneers – instead of waiting to see years of performance data on alternative vehicles. After all, my relatives homesteaded in the Oregon Territory, and I like to Dare to Think Fresh Thoughts! The purchase helps the auto industry, keeps people working, and promotes more sustainable technologies, and a greener environment. It’s lovely to find that opportunities like this news interview just show up when you least expect them, and allow you to have a greater impact on more people than you ever expected.